The incandescent bulb has passed into the domain of old technology with the recent adoption of compact fluorescent bulbs by every day consumers. 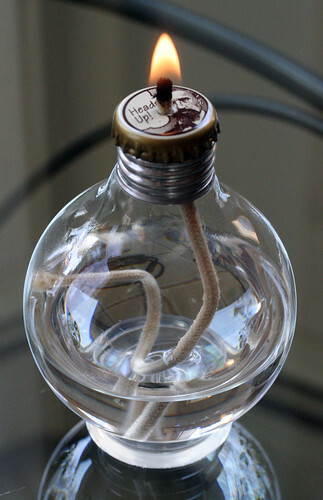 So what to do with those old bulbs? Inspired by Sergio Silva’s piece I set out to transform my old bulbs into ‘slow lights’. 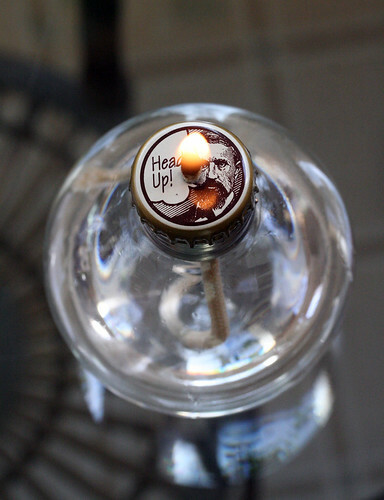 With a little assistance from these handy instructions on how to gut a bulb, a wick, a bottle cap, and some paraffin lamp oil my little Sunday morning project was a success. Sweet. 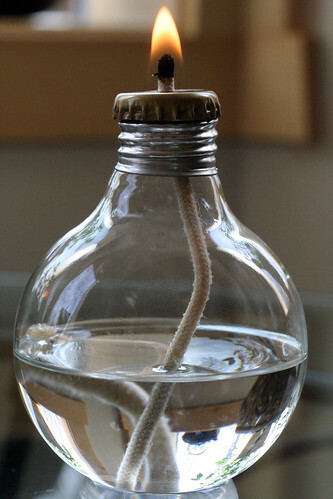 It’s cool that you didn’t need to cut the glass… you need some of those gigantic old bulbs now. You know, the ones the size of my head. Time to raid a few abandoned warehouses. I’d love to get my hands on some of those. They would look great. My only problem now is finding some sort of stand that can keep them fairly stable. A shallow bowl or metal lid of sand maybe? I like the idea of using sand to stabilize the glass. It’s really great idea. Since I put this together I’ve seen some great ideas using he old style bulbs. The best were miniature terrariums!